The Klipsch Sub-12HG is a great solution for people who need a reliable flexible solution. This model is a great combination of high power and crystal-clear output. The down-firing driver design makes it easier to find the appropriate place for it. It also has backfiring ports to make the output sound even deeper and more natural. This solution has four feet that make this model stand still. This model is built using high-quality components only (a BASH amplifier) that guarantee a high level of reliability. 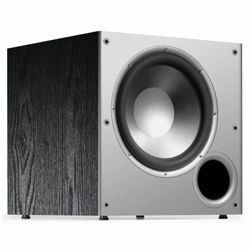 This Klipsch Sub-12HG review should help people understand if this model meets their requirements. The Klipsch Sub-12HG looks very modern with its smooth slightly tapered upper part. The finish is very durable and high-quality so you will not get any scratches on it. This model features four feet that allow this model to stand still on any kind of surfaces, it is also crucial due to the down-firing driver. The front side also has a very small black-color glossy panel with a small LED light with the “Klipsch” label. The LED light can be blue or right – it shows whether this device is on or it is in the standby mode. The dimensions are 18x15x19.8 in and the weight is 40.1 pounds. This weight helps this model to exclude any noise or vibration when you set volume high. The back panel has various knobs. The Sub-12HG specs are quite impressive - this model features a 12-inch down firing driver with a high-power BASH amplifier. It outputs 300 W of continuous power. The dynamic power is 650 W. This model also has a built-in steep-slope (24 dB/octave) low-pass crossover and can be adjusted from 40 to 120 Hz. This model also has phase control. This solution features an “auto power” feature which can turn the subwoofer on and off (or turn on the standby mode) – this system uses the input audio signal to choose the appropriate mode. The frequency response is from 24 Hz to 120 Hz. 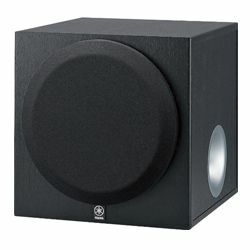 Customers are satisfied with the output sound since it blends well with their right and left speakers. The bass sound is smooth and deep, and it tends to growl a bit during movies. Customers claim that this solution is perfect for movies, while the plate amplifier turned up to 75% of its full power. Some customers also claim that setting the crossover frequency too high may be the cause for the muddy output sound. According to the customers’ experience, this model is great for small and medium-sized rooms, and if you have a large room, then you need at least a couple of such solutions. 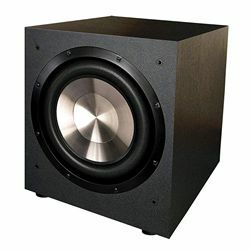 Some customers claim that the only downfall of this model is its limited output for medium-larger and greater room since good ported subs require the enclosure to be large. 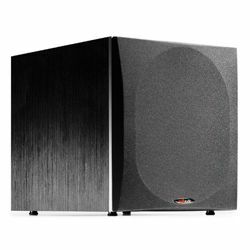 Many customers agree that this model is very powerful – it “shake walls and windows” when the volume is up halfway or more. However, some customers claim that the “auto on/off” feature is not reliable and sometimes it fails. Customers do not have any problems with the Sub-12HG setup process – everything is labeled so you just connect everything up and start tweaking the crossover frequency and volume. If you have a complex set up, which involves a receiver, then you adjust the receiver settings. Overall, customers do not have any issues with it and the whole process does not take too much time. 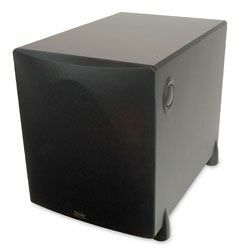 The Klipsch Sub-12HG is a great solution if you need a reliable solution which is able to provide you with enough power. This solution combines its high power and reliability. The down-firing design of this model is also an advantage since it gives you more options for placing this model. This is definitely a modern solution, which is very flexible (you can adjust various Klipsch Sub-12HG settings). 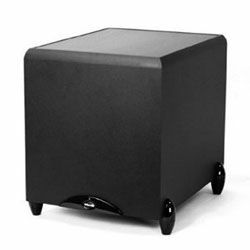 This would be a perfect solution for people who look for a powerful subwoofer for a small or middle-sized room, especially if you are limited in terms of free space.